Almost an hour outside Hiroshima, first by train and then by boat, lies Itsukushima Island, commonly referred to as Miyajima, or Shrine Island. 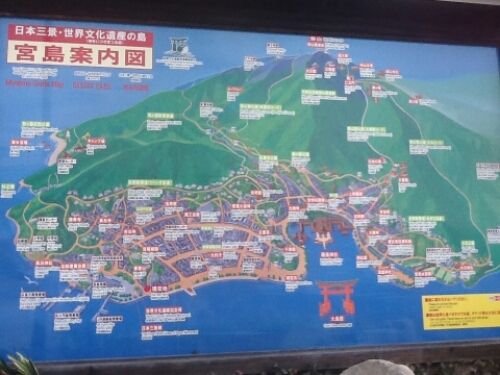 A map of the island. 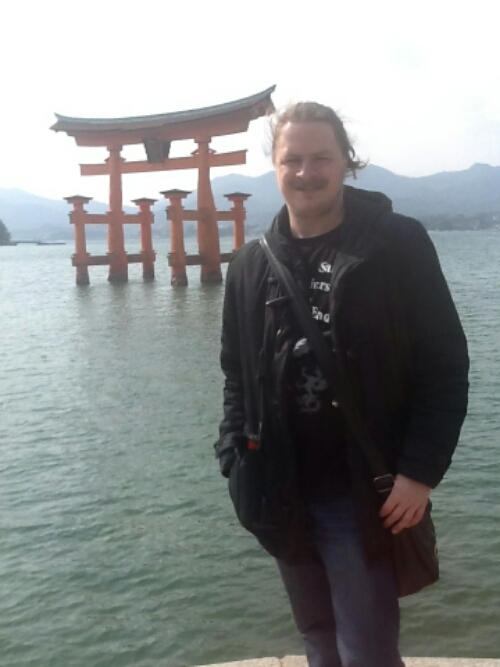 In front of the torii. We took a day trip to Miyajima during our stay in Hiroshima. It is a really nice place to visit and should be on your to-do list if visiting Hiroshima. There are temples scattered all over the island, the main temple is beautiful and the torii, standing as a portal out in the water is a great view. 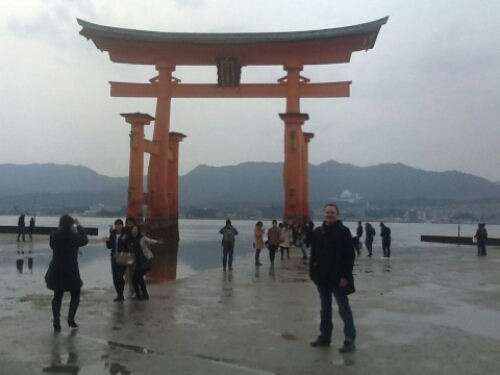 During low tide it is possible to approach, touch and have your picture taken with the torii. 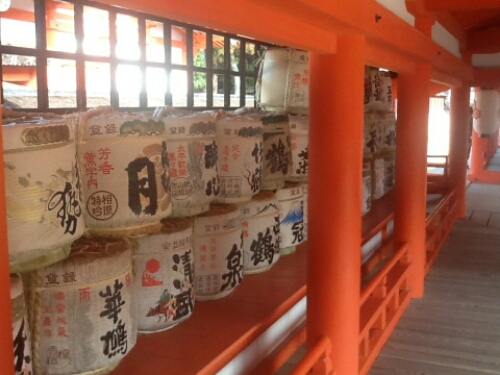 Barrels of sake inside the shrine. At low tide you can walk up to the torii. All over the island deers are roaming freely, relaxing by the many paths, standing outside restaurants begging for food. Considered holy, these animals are mostly left to themselves and has the whole island to wander freely. Mostly they gravitate toward the populous areas where the food is. The local speciality is oysters and they are served in many ways. Raw, cooked, grilled. They were delicious. With one of the island’s many deer. 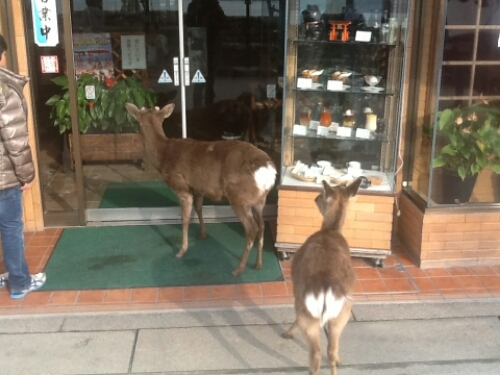 Deer standing outside a restaurant. 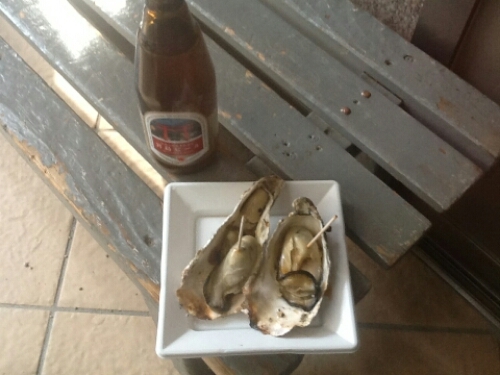 Oysters and the local beer. 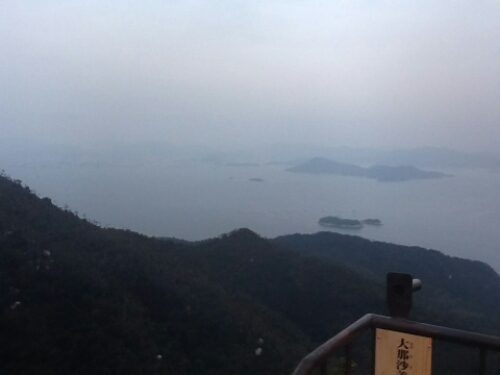 There is also a ropeway, the Miyajima Ropeway, which takes you up to Mount Misen for a great view of Miyajima, Hiroshima and the bay with all its oyster farms. 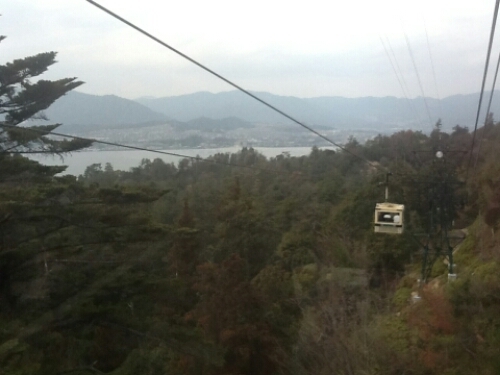 The ropeway stops operating at 5 pm. We were not aware of this, got lucky and just made the final ride up the mountain. As we had to return with the final ride down the mountain we did not get to spend as much time as I wanted on the top. The view was great. Taking the ropeway up the mountain. 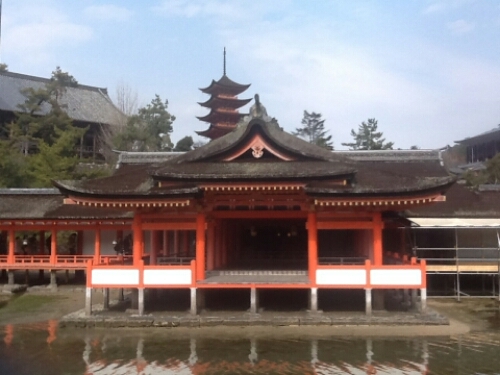 Miyajima offers a great one day trip away from the noisy and busy streets of Hiroshima. The temples are beautiful, the torii is worth the trip almost by itself. The food offered is great and the many Japanese souvenir shops offers plenty of opportunities to buy something to bring home. 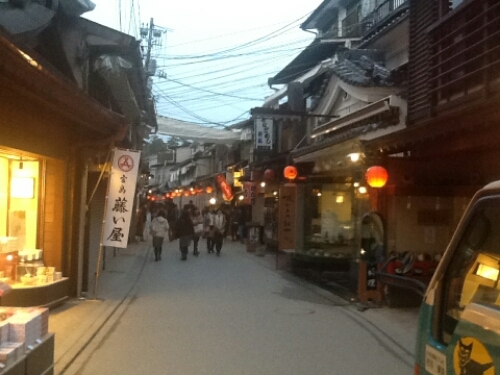 The streets were lined with restaurants and souvenir shops. 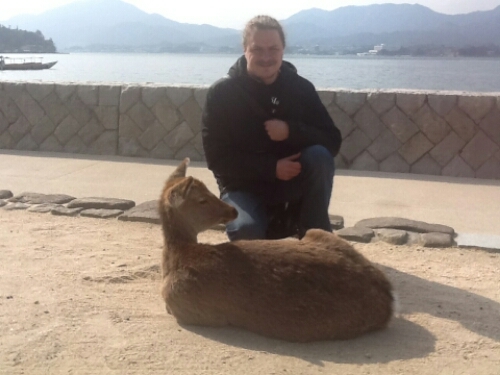 This entry was posted in Japan and tagged deer, hiroshima, Itsukushima, Miyajima, Mount Misen, oysters, UNESCO, World Heritage on July 4, 2015 by Traveltorgeir.